Whether it’s tried-and-true old friend or a recent acquisition picked up secondhand, recovering a tired, worn-out ottoman with removable legs is a simple, beginner-level project. You don’t even need sewing skills. Choose upholstery fabric in colors that complement your home decor or that match the chair or sofa if the ottoman is part of a set. 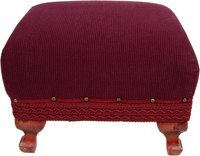 Measure the ottoman beforehand to ensure you get enough yardage to cover all sides and the top of the piece. A professional-grade staple gun is available at most craft, hobby and home improvement stores. Flip over the ottoman, and remove the legs using a screwdriver. Set the legs aside. Spread out the upholstery fabric, wrong side up, on the floor. Smooth out any wrinkles. Center the ottoman, top down, onto the fabric. Trim the fabric, if necessary, keeping enough fabric on all sides to cover each side and a few extra inches to wrap and attach to the bottom of the ottoman. Pull the fabric over one side, and fold it onto the bottom of the ottoman. Secure the fabric to the bottom using a few staples. Make sure to smooth and tug at the fabric to ensure it is wrinkle free and slightly taut. Leave a few inches unstapled at the corner. Repeat for the remaining three sides, leaving the corners unstapled. Miter the fabric at one corner. Pull the mitered fabric against the bottom of the ottoman and staple. Miter the remaining three corners and staple. Reattach the legs using the screwdriver. Flip the ottoman onto its legs.